Pictured are the students having a design class in the new outdoor lounge area. It is nicely shaded by the surrounding trees and at this time of the year it is a great place to read a book, or send a few e-mails. Students sometimes congregate there to chat and discuss their days or plans. There is currently more work being done on the decks in the high school courtyard and a new deck being created outside one of the classrooms. Our students can also be seen doing some woodwork. 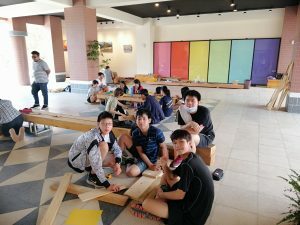 Their teacher firstly explained the goal – to design and then build a small chair and table using recycled wood. This lesson required some knowledge of geometry and then careful planning in order to get the right dimensions and build a solid structure. The students relished this challenge and threw themselves into it with alacrity. After sawing the wood to the correct dimensions, they then used sandpaper to smooth the rough edges. Finally they inserted screws and tightened the pieces together. The results were impressive, and the students showed great pride in their accomplishments. 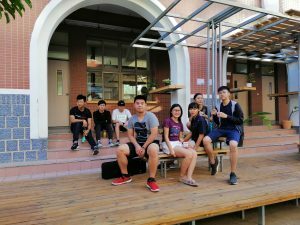 One of our foreign teachers had an idea to keep the campus well-trimmed and neat and tidy. Every week, grounds men on gas-powered lawn mowers, or grounds men using trimmers can be seen and heard throughout the campus – it’s often pretty noisy! The idea was to introduce a small flock of sheep or goats, maybe ten or a dozen. They would then eat the grass, and there would be no need for the sounds and smells of the gas powered vehicles and apparatus. Unfortunately, health and safety regulations prohibit such a move, but the idea is environmentally friendly. One of our English teachers here at the academy has recently also seen his book become published. The novel “Hannelore” is a work of historical fiction set at the end of WWII. It is based on the true story of his mother’s escape from the rapidly advancing Soviets in early 1945. It documents the largest, and possibly least known, example of ethnic cleansing in recorded human history: thirteen to fifteen million ethnic Germans displaced forever from their ancestral homelands. It took a great deal of time for him to accurately research the topic. This teacher writes, creates, and organizes the writing curriculum and programme for the advanced classes here at the academy.